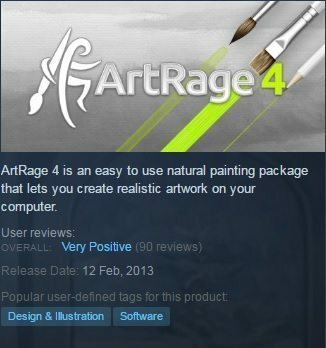 We will not be offering ArtRage 5 through Steam. Existing Steam owners of ArtRage 4 will be able to continue using their software, and will be eligible for an upgrade discount to ArtRage 5 through our member area. We are unable to offer discounts through our member area to ArtRage 3 Steam users (our website cannot support it) but we are offering the 50% off sale on ArtRage 4 through Steam to allow everyone a chance to upgrade to ArtRage 4 using the upgrade discount there (Steam users will get 75% off going from ArtRage 3 to ArtRage 4). Steam users with ArtRage 4 will be eligible for the standard 50% off upgrade discount to ArtRage 5. You can access this discount by registering your Steam serial number in our member area. The discount will become available when ArtRage 5 is released. You can find your serial number by right clicking ArtRage 4 in your Steam library and choosing ‘view CD key’. Copy this and register it in our member area.